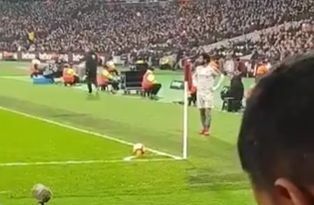 Some footage has emerged on Twitter of Liverpool star Mohamed Salah being racially abused at the West Ham game on Monday night. You can see the video clip below as also flagged up by our friends at Empire of the Kop, but we warn it contains foul language and Islamophobic content. English football has had its problems with racism in the past and it rather worryingly seems to be back with a force this season. As reported by BBC Sport earlier in the campaign, Manchester City winger Raheem Sterling was targeted in his team’s defeat against Chelsea. Let’s hope we can spread this video around and help ensure this fan is banned from attending football games for life, with a tough stance needed to eradicate this disgusting behaviour. Away from football, the Guardian have reported a record number of anti-Muslim attacks in the UK last year. With so much fear-mongering in some sections of the UK press (explained well here by the Huffington Post), it’s vital to call this out and show solidarity with Salah and anyone else targeted like this whenever it happens.